Tom est beau, mais Henri et Bob sont très beaux. Tom is handsome, but Henri and Bob are very handsome. Yvette est belle, mais Leila et Belinda sont très belles. Yvette is beautiful, but Leila and Belinda are very beautiful. C'est un bel animal parmi de beaux animaux. It's a beautiful animal among beautiful animals. 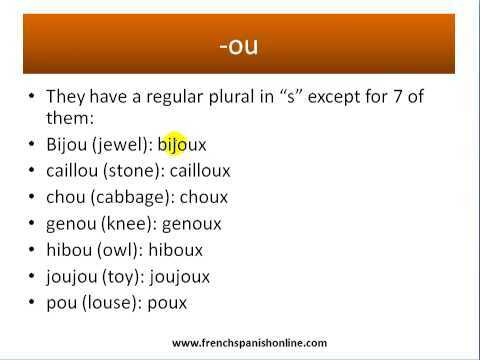 Note that to form the masculine plural, adjectives ending in -eau add -x, and vieux doesn't change. As for the feminine plural, it is regular and simply takes an -s.
The masculine forms bel, nouvel and vieil (when in front of a vowel) become the regular masculine plural beaux, nouveaux and vieux. Mon nouvel ami s'entend bien avec mes nouveaux amis. My new friend gets along with my new friends. J'ai acheté de nouveaux bols et de nouvelles assiettes. I bought some new bowls and some new plates. Regarde ces vieux hommes et ces vieilles femmes. Look at these old men and these old women. Ce vieil arbre est à côté de ces vieux arbres. This old tree is next to these old trees. Please confirm. The masculine forms bel, nouvel and vieil are used before a noun that begins with a VOWEL. This rule does not apply to a noun that begins with an H? Par exemple: Regarde ces vieux hommes. Merci. Unfortunately, this question has no black and white answer, because there are to versions of "h": h aspiré and h muet. The point is that the "x" can be pronounced if necessary, as in the case of "vieux hommes". Merci Alan. So singular: le vieil homme. Pluaral: les vieux hommes. why is the 'de' not plural for 'des', as we are talking about 'some beautiful animals'? Les nouveaux voisins sont arrives. Les nouvelles voisines sont arrives. Sorry I can't work the accent for arrives. Les nouveaux voisins sont arrivés. Les nouvelles voisines sont arrivées. Good Morning Teachers and helpers. I have a question about neighbours in the feminine plural. See answer to this question in your next post. Sorry bols not bowls spell checker can't cope with French spelling! Nor would it embolden each 'des'. Je crois que "des" devient "de" devant les adjectifs que se placent devant le nom? Peut-être je me trompe. Bonjour Anne ! Sar is right, and here is a link to our related lesson: Using ''de / d' '' instead of 'des' in front of adjectives preceding nouns (partitive article) À bientôt ! Is it 'nouveaux araignees' rather than 'nouvelles araignees' ? Bonjour Matthew, No, you're a bit mixed up. Per the note at the bottom of the lesson: "The masculine forms bel, nouvel and vieil (when in front of a vowel) become the regular masculine plural beaux, nouveaux and vieux." Feminine nouns always use their feminine forms; it's only singular masculine ones that have the special form.